Anna Elizabeth Barclay Carter is a sister of Alexander Barclay and his heir. Anna was born on the 15 of April, 1870 in Eagle Creek. She is present in the Federal and state census of 1870, 1875, 1880, 1885. She is also the youngest child of John Barclay and his second wife Ellen. It is possible that her middle name is Ellen, not Elizabeth per a cousin 11/26/2017. She married David Maurice Carter on 9 July, 1885 in Scott Co., Minnesota. Marriage Announcement for Anna & David. Married – At Eagle Creek, July 9, 1885, by F.P. Pond Esq. Mr. David Carter to Miss Anna Barclay, youngest daughter of Mr. John Barclay of Eagle Creek. – Shakopee Courier July 15, 1885. Carter, David, Anna Barclay, July 9, 1885, Book E, page 196 Scott Co. Marriages, Minnesota. Anna and David Carter lived in an area of Wisconsin which is right on the border of Michigan so you might see to two towns intertwined in the records of people who lived in this area. These towns are on the shores of Lake Michigan and protected by Green Bay Harbor. I have seen Lake Michigan but only from its very southern tip. It is more like an ocean. Be advised that I am not an expert on the Carter family which looks like it has very interesting history being of French Canadian origins. There are cousins who know more and what I present here is just a summary so if you want to obtain further information leave a comment and I can contact you to chat. I am also basing this information on what the census is revealing and cemetery information, more needs to be done. In 1900 Anna and David Carter appear in the Marinette, Marinette Co., Wisconsin census. It looks like a brother is nearby? Line 27, 826, 125, 149, David Carter, Marinette Ward 2, Marinette, Wisconsin, age 35, born about 1865, birthplace Canada French, Spouse is Annie E., White, immigrated 1870. Annie. E. Carter age 30, Marey L. Carter age 12, David W. Carter age 8, Joseph Carter age 4, Frederick A. Carter age 1. Line 21, 828, 124, 148, Joseph Carter, Head, W, M, June 1864, age 35, married 4, Canada Fr. Immigrated 1868, 52, Na. Woodsman Canada French, born about 1865. Carter, Marey, wife, W, F, May 1872, 28, 4, 3, 3, born Switzerland, parents born Switzerland, immigrated 1882, 18, Carter, Henry, Son, W, M, born Jan 1897, 3, S. Carter, Earl, son, W, M, born Nov. 1898, 1, S.. Carter, George, son W, M, born April 1900 2/12, S. Fageuchau, Adeline, Servant, W, F, born June 1885, 14, S, born Michigan, parents Norway, Servant. Source: 1900 U.S. Federal Census, Marinette, Marinette Co., Wisconsin, SD#8, ED#114, Sht #9, enumerated 6 June 1900, by Charles Bell. In 1910 Annie and David Carter are living in Marinette, Marinette Co., Wisconsin. His job looks very interesting in the place he works at. page 1, Line 98, 2050, 193, 202, Carter, David, Head, M, W, 50, M1, 25, born Wisconsin, parents born Canada French, All English, Engineer, Insane Asylum, W, No, O, Yes, yes, O, M, H, 12, 9, 7 X, Carter, Anna E. Wife, F, W, 40, M1, 25, 13 children born, 9 living, born Minnesota, father Scot, Scottish, mother Nor. Norwegian, none, yes, yes. Carter, John J., son, M, W, 20, S,born in Wisconsin, father born Wisconsin, mother Minnesota, Knitter, Knitting Mills, W, yes, O, Yes, yes, No. 1 – 0 – 7 6.
line 1, 193, 202, Carter, William D., son, M, W, 18, S, Gloves Factory, W, No., O, Yes, Yes, No. Carter, Joseph M., son, M, W, 14, S, yes, yes, yes. Carter, Frederick A., son, M, W, 11, S, yes, yes, yes. Carter, Leo B., son M, W, 9, S, yes, Carter, Rose, C, daughter, F, W, 8 S, yes. Carter, Grace L., daughter, F, W, 5, S, yes. Carter, Fransis A., son, M, W, 3, S, no. We find them again in 1920 in Marinette. Line 26, 2350, 269, 301, Carter, David, Head, O, F, M, W, 65, M, 1860 Na, Unknown, no, no, Canada, French, Canada, French, yes, engineer, factory, W.
Carter, Anna E, wife, F, W, 49, M, yes, yes, Minnesota, Scotland, English, Norway, Norwegian, yes, none. Source: 1920 U.S. Federal Census for Marinette, Marinette Co., Wisconsin, 2nd Precint, SD#8, ED#190, Sht #14A, Ward 2, 9 and 10th January, 1920, Carl. E, Peterson. 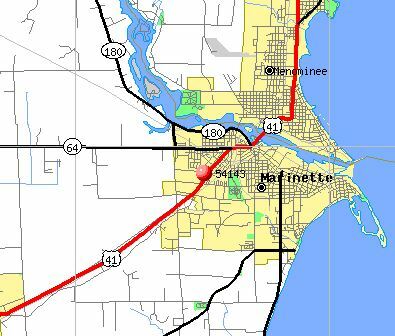 They continue to live in Marinette in the 1930 census. They have a daughter and granddaughters living with them at this time. Line 39, 2050, 442, 548, Carter, David, Head, $5000, R, yes, M, W, 75, M, 30, No, Yes, French Canada, Canada, French, 1860 Nat. yes, Truck farming, farming. Source: 1930 U.S. Federal Census, Marinette, Marinette Co., Wisconsin, Second Ward, ED#38-12, SD#6, Sht #20A, April 21, 1930 by Eleaear C. Hanson. In 1940 Anna is a widow now but she has several children still living with her. She has moved southwest of Marinette. Line 12, 159, 0, 300, yes, Carter, Anna E, Head, F, W, 69, Wd, No, I, born Minnesota, all same house. Source: 1940 U.S. Federal Census, Peshtigo, Marinette, Wisconsin, SD#8, ED#38-29, Sht, #9A, Enumerated June 7, 1940, by Ralph Stawdenmain. Anna and David Carter had 13 children of which 9 were living in 1900. I only have 12 children. The following should be followed out in the census to get a better picture of their lives and of course, more research to get a better picture. The children of Anna and David have corrections added to them in order to update the information as of 11/26/2017. James Carter b. 10 June 1886, d. 11 June 1886. 2. Mary Leillie Carter she was born 27 December, 1887 in Marinette, Wisconsin Michigan and died about 1901 in Menominee, Michigan. She is buried in the Riverside Cemetery in Menominee. Mary appears in the 1900 census. I have seen her name written Marey. 3. John J. Carter was born 6 Jun, 1890 in Marinette, Wisconsin Michigan and died 13 May 1975 in Peshtigo. According to a cousin he died in Moses Lake, WA. He is buried in the Riverside Cemetery in Menominee. He appears in the 1910 census. David W. Carter born about 1892. He appears in the 1900 census. 4. William David Carter, was born 16 February 1892 in Wisconsin. He died 3 November 1969 at Rice Lake, Barron, Wisconsin. He is buried in the Nora Cemetery in Rice Lake. He married Myrtle N. Jarvis born 20 January 1892 and died 3 December, 1977 at Rice Lake. She is also buried in Nora Cemetery. 5. Elizabeth Susan Carter, born about 1894 in Marinette. I don’t have much on this child. She died 3 Jul 1895 in Marinette, Wisconsin. 6. Joseph Maurice Carter born 25 March 1896 in Marinette, Wisconsin. He married Maude Marie Martin born 31 May, 1898, Thompson, Winnebago, Iowa. They had about eleven children: Maurice, Arthur, Aurora, Gertrude, Douglas, Mary Ann, Richard, Joseph, Norma, John and maybe another. Her parents were John Calvin Martin and Mary Ann Caroline Reidel. Joseph and Maude are buried in the Kristiansand Cemetery, Tioga, Williams Co., North Dakota. Joseph died 1 August, 1955 in Sidney, Richland Co., Montana. Maud died 10 June 1936 in White Earth, Montrail, North Dakota. Find A Grave has their tombstone with information. Maude’s parents were John Calvin Martin and Mary Ann Caroline Riedel. 7. Frederick A. Carter was born 3 September 1898 in Marinette, Wisconsin. d. 26 Sep 173 in Cheyenne, Laramie, Wyoming. He married Mary Ann Caroline Martin b. 30 Mar. 1903 in Thompson Iowa. They married on 5 Sep 1918 in Schafer, North Dakota. She died 21 Nov, 1998 in Mandan, Morton Co., North Dakota her parents were John Calvin Martin and Mary Ann Caroline Reidel. Frederick and Mary had: Rosemarie, Illa, Constance and Edward Donald Carter, married Mary Wilma Mantich and they have living descendants. 8. Leo Bernhard Carter was born 3 July, 1900 in Marinette, Wisconsin, d. 20 Mar, 1987 in Crivitz, Wisconsin. 9. Rose Ceceila Carter was born 1 February, 1902 in Marinette, Wisconsin. She died in 1910 in Menominee, Michigan and is buried in Riverside Cemetery in Menominee. 10. Grace Loretta Carter was born 30 April, 1904 in Marinette, Wisconsin and died about 1989 in Peshtigo, Marinette, Wisconsin. She is buried in the Riverside Cemetery. She married a Frank Kapaun and they had several children. She married a Herman E. WIlkie b. 1889 and died 1964 in Peshtigo, Marinette, Wisconsin. His parents were Fred Wilkie and Mathilda Youngchild. 11. Francis Aerold Carter born 24 May 1906 in Marinette, Wisconsin and died 20 Mar, 1911 Marinette, Marinette Wisconsin. He is buried in the Woodlawn Cemetery in Marinette. 12. Gertrude Mabel Carter, b. 3 Apr. 1908, Marinette, Wisconsin d. 2 Sept 1908, Menominee, Michgan. 13. Premature Carter, b. 3 Apr, 1909 in Marinette, Wisconsin. 12. David F. Carter born 8 March 1911 in Marinette and died 2 November, 1988 in Milwaukee Ironwood, Michigan. He is buried in the Wood National Cemetery in Milwaukee. The father, David Maurice Carter died on the 28th February, 1938 in Marinette. He is buried in the Forest Home Cemetery in Marinette. This article states that he was born in 1850 not 1865 as indicated by the 1900 census above. Death Claims David Carter, date of death 2/28/1938 – Long-Time Resident Succumbs in Home on South Shore Today, David Carter, 88, a longtime resident of Marinette county, passed away in his home on the South Shore across from Camp Wehakee Monday afternoon. Born in Green Bay on Jan. 9, 1850, Mr. Carter was a survivor of the Peshtigo fire, having taken refuge in the river. After the fire he came to Marinette and hand remained here since. He had been ill with heart trouble for the past five years. Besides hi widow he is survived by the following hcildren: John J. city; Mrs. Walter Zinn, Menominee; Joseph, White Earth, North Dakota; Fred, Denver, Colo.; David Jr. Porterfield; Mrs. Andrew Carlson, Menominee; and Mrs. Herman Wilke, city, also one sister, Mrs. Herman Lisner, Escanaba, Mich. and twenty-five grandchildren. The body is at the McLain Funeral home. Funeral arrangements are not complete, and will be announced on Wednesday. Mrs. Anna E. Carter, 85, former Marinette resident who had been making hr hom eiwht her son in law and daguther Mr. and Mrs. Andrew Carlson, 1315 16th Ave, Menominee, died there at 10:45 pm Thursday. She had been in ailing health for five years. Mrs. Carter had resided in Mrientte for 52 years prior to moving to the Carlson home two years ago. Her husband, David, died in 1938. She was born April 15, 1870 in Shakopee, Minn. and came to Marinette as a young woman. Surviving with Mrs. Carlson are two other daughters, Mrs. Lillian Zinn of Menominee and Mrs. Herman Wilke of Marientee; five sons, John Cater of Mae, Wash., William D. Carter of Milwaukee, Fred A Carter of Grand Junction, Colo. Leo Cart of Marinete and David Carter of Putaskey, Mich; 24 grandchildren and 10 great grandchildren. A son Joseph died Monday at Sidney, MOnt. and Mrs. Carlson and her borhter Leo are enroute home from attending the rites. Funeral arrangements will be announced later. The body is at the Lemieux-Degayner funeral home. I have had the honor of meeting descendants of Anna’s in the past. They have been kind in sharing about their family history. I therefore have presented here my study of this family which needs more work of course. If you would like to share or learn more leave a comment. UPDATE: As of September 29, 2017 I have heard from Jim Carter a descendant of Anna Barclay Carter and David Carter. He has shared with me his “Ancestral Meanderings: A brief assemblage of narrative and photographs of the Carter/Barclay, Mantich/Haljcsik and Martin/Riedel lineages. A PDF of his family history. Contact me at bjmcdonell@gmail.com and I will be happy to get you in contact with him. He has more information on the children of this couple. He has also helped me to get a better handle on the children of Anna Barclay Carter and David Carter. I am grateful. The family lore is that Grace was not strong, but I don’t agree. She was her father’s daughter and also a little of her mother. You can see what I mean as you read the following account of the events of the marriage. Grace and Ronald did marry on September 8, 1898 in Hudson, St. Croix County, Wisconsin. Hudson is just across the state line between Minnesota and Wisconsin and not that far from Minneapolis/St. Paul. The distance is 29 miles by our freeway standards. The marriage record is quite odd and very plain. It has no identifying publication marks stating it is from Wisconsin. It almost looks like a scrap of paper. I do have the Wisconsin Vital records application and the envelope this Marriage record was returned to me in. You will have to take my word that the marriage was performed in Wisconsin. Ronald S. McDonald is the husband, his father is Archibald, his mother is Mary. Ronald’s occupation is lumberman and his residence is given as Duluth. He was born in Canada. Grace’s name is written “Gray A. Barclay.” Her parents are George A. Barclay and Amarilla Spracklen. She was born in Pine River, MN. 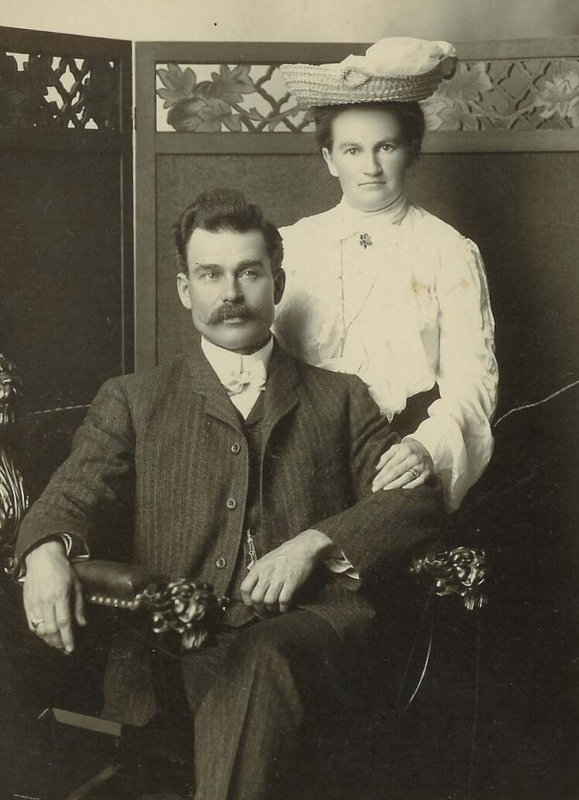 They married on Sept. 8, 1898 in Hudson, St. Croix Co. (I wrote in the state). They are white. The ceremony was Presbyterian. The witnesses were Mike Dorgan and Grace & Charles Burnley. The witnesses were from Hudson, St. Croix Co. The marriage was registered September 26, 1898 and the parties were sworn. What do I think about this information? Well there are a few pieces of information that are very interesting. The first is that Ronald’s place of residence is Duluth. I have suspected that he did live there. The other piece of information is the marriage ceremony was Presbyterian. Ronald was Catholic. Grace her religion was unknown. He basically married outside his faith. The witnesses are also intriguing because their names are unfamiliar to me. Their residence is given as Hudson? My Aunt Miriam, didn’t know when and where her parent’s marriage took place, it has been solved. The lesson learned is that if you can’t find it in the state they are residing in then try the neighboring states. I mentioned that the marriages was in secret. This is true. Grace’s father George Angus Barclay was not happy about it and threatened to disinherit her. He said an unkind comment about grandfather Ronald which I will not repeat here. Apparently, father and daughter made up in time. For more information about this marriage see the blog: The Man Who Lived Airplanes. Go to the right side of this blog and you will find it listed under BJ’s Family History Blogs. This other blog goes into detail about the Mac/McDonald side of the family. The marriage of my grandparents, Grace A. Barclay and Ronald S. McDonald united these two families. Their youngest son Keith would be my father. After the Death of John Barclay his wife Ellen lives another 10 years! Ellen Barclay lived another 10 years after her husband John Barclay. She died in 1907. In this post I want to share what I know about Ellen, because I think it fits with John Barclay’s end of life. They had been together 29-30 years and had 4 children. The children were Charles, William, Mary E., Anna Elizabeth. I will go into more detail on the lives of John Barclay’s children from both marriages, when I get to the death of Alexander Barclay who was a half-brother to Ellen’s children and full brother to the first seven, Margaret’s children. Alexander left a very involved probate file when he died in 1906. He was George Angus Barclay’s full brother and my great grandfather and subject of this blog. Her name has been a frustration because documents have her as Helen or Ellen. The writing was so bad you could not read it. The tombstone has her name as Ellen so I will use that name. In John Barclay’s obituary notice it was said that her maiden name was Iverson but in her own obituary it is listed as Stevenson. It is possible she was married before John, but so far I do not see any evidence for a first marriage for Ellen. It is also possible that the use of Iverson was a mistake. I am choosing to go with Ellen Stevenson Barclay till I am sure. There is so much more research to do on Ellen Stevenson Barclay. I wish I had the time. Ellen is the second wife of John Barclay and I do not descend from her. I descend from Margaret and frankly I am more interested in finding the origins of John Barclay and his first wife Margaret. So I present what I have learned about Ellen for those who would be interested. In order to understand Ellen’s life you need to review some of the posts I have written about John Barclay. She will be featured in census and other documents like deeds, etc. You can find other posts by using the search box on the right of this blog. You can also seek out the Categories on the right of this blog and under SURNAMES you will find “Barclay Surnames.” From there scroll down and you will find John Barclay and Ellen/Helen Stevenson. Unfortunately the names are alpha order rather than by the lineage. So what happened to Ellen after John’s death? On 13 February 1899 another son William Barclay sells his share of the land to his brother Charles. For a sum of $1800.00, Wm. and wife Clara E. Barclay are residing in Mammoth, Madison Co., Montana sold to Charles Barclay residing in Eagle Creek, Scott Co., Montana to-wit, the south 1/2 of the NE qtr of Sec. 23, Twp. 115, Range 22, 80 acres according to gov. survey. Except a certain mortgage payable to Henry Hinds of Shakopee. Witnessed by W.R. Macfadden and F. H. Wilbour and signed by William Barclay and Clara E. Barclay in the State of Montana, County of Madison etc. Source: Deed of Wm. Barclay and wife Clara E. to Charles Barclay, February 13, 1899, Vol. 47, pg. 33 #12062, Scott Co., Minnesota, FHL #1255727. After John’s death in 1897, we find that the next census is the 1900 U.S. Federal Census. In this census we learn that Ellen was living with her son Charles. This census shows us that the only child that is still around is Charles. The remaining three children of John and Ellen have married and migrated elsewhere. William and Mary E. went to Montana. Anna married and went to Wisconsin to live. Charles is a mystery. After his mother’s death it is difficult to determine where he went. There are possibilities for a Charles Barclay living in Minneapolis/St. Paul. 28/28 Barcley, Charlie, Head, Jan. 1860, 40 years old, single, born in Minnesota, Father born in Scotland, mother born in Norway, farmer, educated, land info. Barcley, Ellen, mother born Apr 1833, 67 years widow, one child born, one child living, born in Norway and both parents where born in Norway. Naturalized 1858, 45 years in country (means she immigrated in 1855), educated. Carter, John, Nephew born Feb. 1890 10 years, single. Born in Wisconsin, Father born in Canada Fr., mother Minnesota, at school, 8 grade, educated. Source: Charlie Barclay & Mother, 1900 U.S. Federal Census, Eagle Creek, Shakopee, Scott County, Minnesota, FHL#1240788, Microfilm T623, Roll 788, page 142, SD ?, ED 172, Sheet #2. I do not understand the number of children fro Ellen in this census. All her children lived long lives? 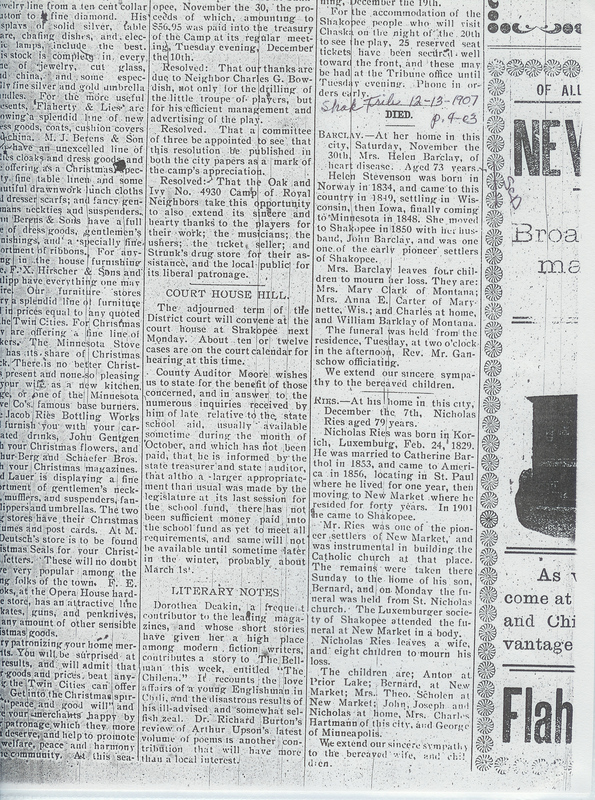 Something happened in 1904 because a notice in the gossip column of the Scott County Argus was featured on May 20, 1904. I have no idea what this means? 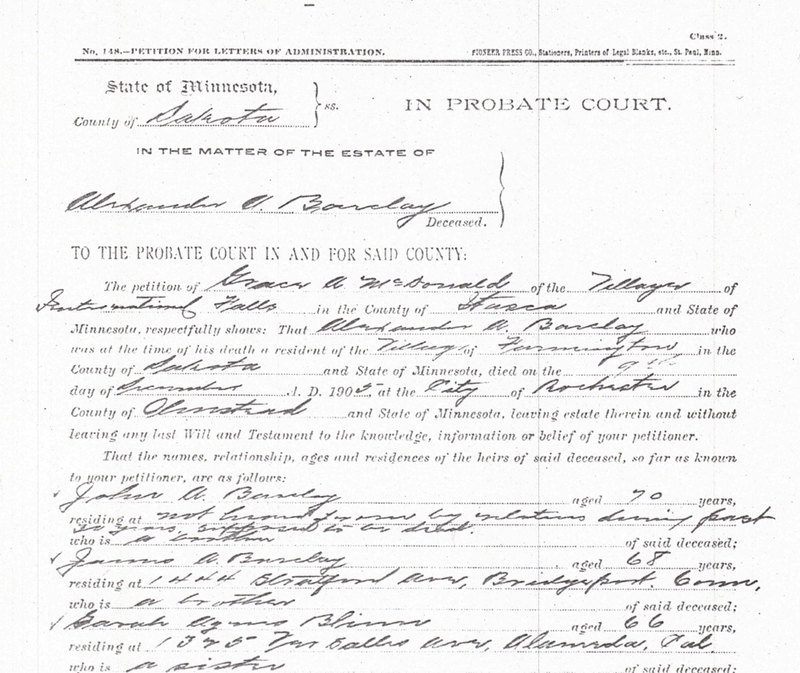 In 1906 he is still living in Shakopee per his half-brother Alexander Barclay’s probate case. This probate will be featured indepth at a later time on this blog. Charles Barclay, aged 45 years, residing at Shakopee, Minn., who is a half-brother. 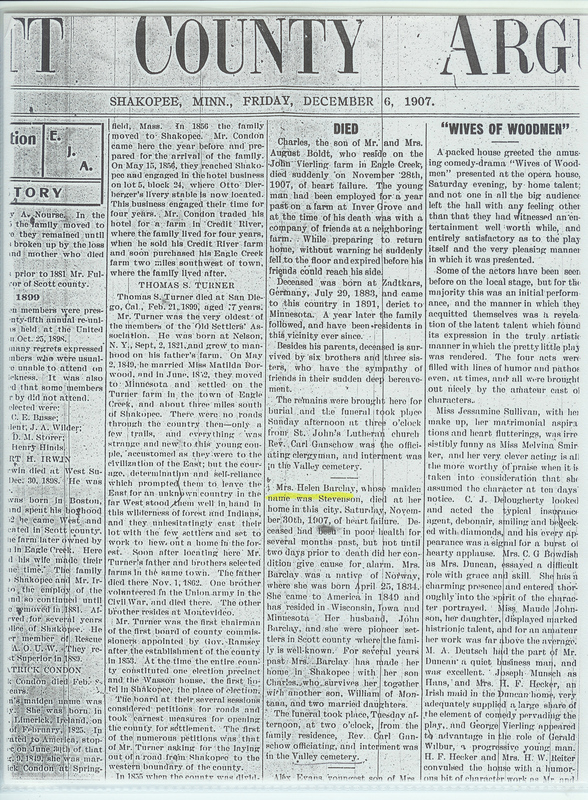 Ellen passes on 30 November 1907 in Shakopee. She is buried with John in the Valley Cemetery in Shakopee. You see that they use the name Helen in the obituary notice but Ellen is on the tombstone. Helen Barclay Death Notice Shakopee Tribune Dec. 13, 1907 pg. 4 col 3 Maiden: Stevenson also in the Argus on Dec 6, 1907 pg. 1 and col 4. Died – Barclay – At her home in this city, Saturday, November the 30th, Mrs. Helen Barclay of heart disease. Aged 73 years. Helen Stevenson was born in Norway in 1834, and came to this country in 1849(39?) settling in Wisconsin, then Iowa, finally coming to Minnesota in 1848. She moved to Shakopee in 1850 with her husband, John Barclay, and was one of the early pioneer settlers of Shakopee. Mrs. Barclay leaves four children to mourn her loss. They are: Mrs. Mary Clark of Montana, Mrs. Anna E. Carter of Marynette, Wis.; and Charles at home, and William Barklay of Montana. The funeral was held from the residence, Tuesday, at two o’clock in the afternoon, Rev. Mr. Ganschow officiating. We extend our sincere sympathy to the bereaved children. 2nd Obit – Scott Co. Argus – Friday, Dec. 6, 1907 – Died – Mrs. Helen Barclay, whose maiden name was Stevenson, died at her home in this city, Saturday, November 30th, 1907, of heart failure. Deceased had been in poor health for several months past, but not until two days prior to death did her condition give cause for alarm. Mrs. Barclay was a native of Norway, where she was born April 25, 1834. She came to America in 1849 and has resided in Wisconsin, Iowa and Minnesota. Her husband, John Barclay, and she were pioneer settlers in Scott county where the family is well-known. For several years past Mrs. Barclay has made her home in Shakopee with her son Charles, who survives her together with another son, William of Montana, and two married daughters. The funeral took place, Tuesday afternoon, at two o’clock, from the family residence, Rev. Carl Ganschow officiating, and interment was in the Valley Cemetery. 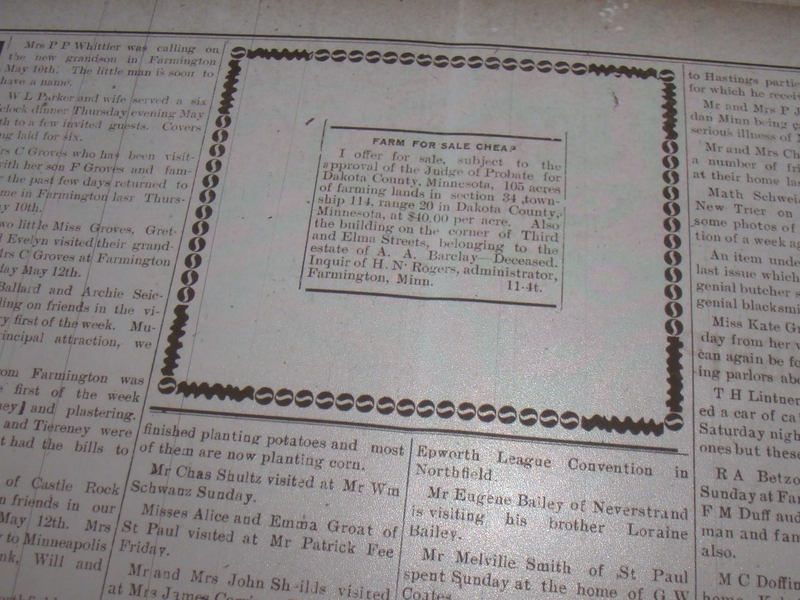 Helen’s obituary notice Dec 1907. The above information gives us some good information on Ellen/Helen Iverson/Stevenson. Ellen left a probate file and will. I will present that in the next post. The other problem is that not a lot of documents have been filmed by the Family History Library for some of the counties of Minnesota. So access to the documents is onsite. I have traveled to Minnesota three times and would love to go back for more research, we will see. 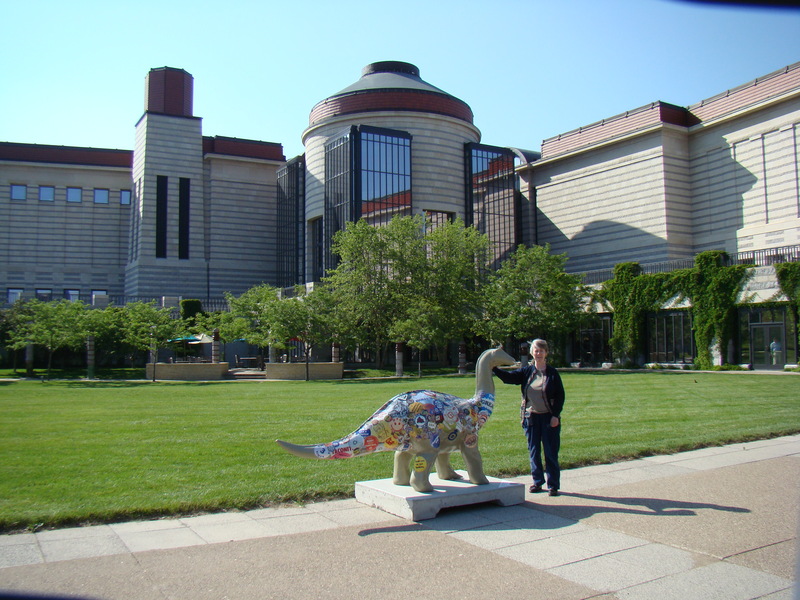 Me at the Minnesota Historical Society 2007, my third time there. My great-grandfather George did apply for his Civil War pension. I will be writing about that in future posts but at this time I am taking a break from this blog to focus on other lines of my family. Ronald S. McDonald married Grace Barclay, the daughter of George and Amarilla. These two individuals are my grandparents. I have not posted about this marriage on this blog for I am trying to be chronological about George and Amarilla’s lives and events. Ronald and Grace married in 1898 in Wisconsin, in secret! Ronald’s family came from Quebec and probably originally settled in Ontario. 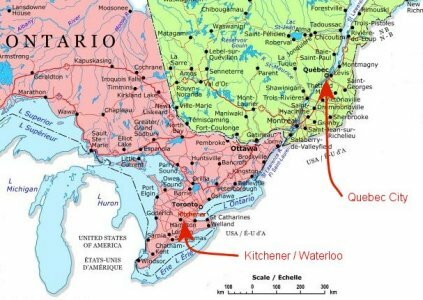 I have long wanted to visit Ontario and Quebec and will be doing so soon. Don’t worry, I will let you know what is happening as I travel along. The Man Who Lived Airplanes will be the main focus of the trip to Ontario and Quebec. The Boardman and Browns will cover the visit to Hastings County and British Columbia. I am trying to keep the research specific to the theme of the blog. There are several choices to participate and contact me, either on this blog or the others. You can click “follow” and it will send you a notice of any updates. It usually shows up on the right side of a post like a hover. You can make a comment on a post. Click on “Leave a Comment.” I like comments. I will try to get back as quick as I can but when I travel it can be a challenge. All comments are approved by me before they are published. You can “subscribe “and I am the only one who knows who you are. See the box on the right of the blog in the side bar. You can go to the “About and more” or “Compiler and More” or “About” page on the top of one of my blogs and scroll to the bottom before the “Shared List” stuff and find my Gmail – cut and paste that into your email browser. There are other suggestions to find me on that page. Click “Like.” To find this box click on comments and it is hidden there at the bottom. There are actually “Barkley’s” and Kellers Canada. I wonder?